7-2 accurate means of identifying one specific item of material. Each company develops a system to meet its own needs. The Department of Defense (DoD) supply system stocks over 4 million items. The Navy supply system alone stocks over 1 million items. Because of that, the federal catalog system was developed. It ensures the proper requisitioning of items from either an activity ashore or from a unit of the mobile logistics support force. The federal catalog system is responsible for naming, describing, classifying, and numbering all items carried under centralized inventory control by the DoD and the civil agencies of the federal government. In all supply functions from purchase to final disposal, only one identification may be used for each item. This system also serves as an economy measure. Instead of the Army, Navy, Air Force, and civil agencies each purchasing and maintaining large stocks of materials, all agencies can make use of centralized stocks. North Atlantic Treaty Organization (NATO) countries also use the federal catalog system. STOCK AND CONTROL NUMBERS Stock and control numbers are used to identify and order material in the supply system. The identification numbers are known as national stock numbers (NSN), a variation of the NSN referred to as a NATO stock number, Navy item control numbers, and local item control numbers. A definition and description of the types of stock and control numbers are stated in the following paragraphs. National Stock Numbers The national stock numbers (NSN) are the most common numbers used to identify material. An NSN is a 13-digit number consisting of a 4-digit federal supply classification (FSC) code number and a 9-digit national item identification number (NIIN). Figure 7-1 shows the typical NSN format. Figure 7-1.Typical NSN format. The federal classification code (FSC) number identifies an item by commodity or description. The first two digits of the FSC are called the FSC group, and the last two digits of the FSC are called the FSC class. Figure 7-2 is an example of the FSC system. The first two digits denote the group or major division of the commodities; for example, group 53 is hardware and abrasives. The last two digits (for example, 05) denote the class or subdivision within a group. In other words, screws are a class or subdivision in the hardware and abrasives group. The national item identification number (NIIN) identifies each item of supply used by the Department of Defense (DoD) and the North Atlantic Treaty Organization (NATO). The NIIN relates to identification data that makes an item of supply different (as far as DoD is concerned) from every other item of supply. The amount and type of identification data depend on the item and its intended use. Although the NIIN is part of the national stock number (NSN), it is used independently to identify an item. 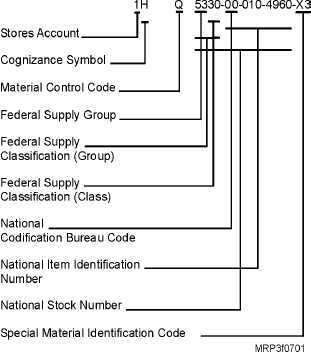 Except for identification lists, most federal supply catalogs are arranged in NIIN order.